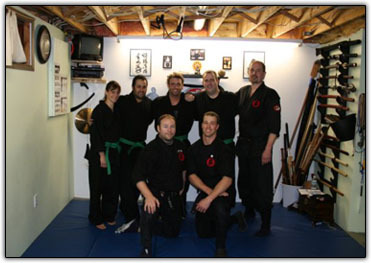 I, Jamie Daiken, am the owner, Chief Instructor and founder of Way of the Warrior Bujinkan Dojo, which I opened in 2006. I had just received my Shidoshi-ho license and was eager to share all of the amazing lessons and experiences I had experienced. In 2009, I moved the dojo from Hamilton to Stoney Creek and continue to teach and train regularly at this permanent location. Studying the nine ancient schools of the Bujinkan is our primary focus. Each class, we examine principles and practice various skills and aspects of Soke's teachings as well as Shihan Van Donk's teachings, to further our own understanding, and to help you learn and understand this wonderful art. I have been a personal student of Shihan Van Donk for over 7 years, and have learned so much more then I really ever set out for. I currently hold a fiveth-degree black belt in Bujinkan Budo Taijutsu, and a black belt in Dynamic DeCuerdas Eskrima. Among other certifications, I am a licensed agent of the National Security Alliance, I possess a Master Level Reiki Degree and I have participated in and won several International Weapons Tournaments. I have been to Japan and I have trained with Soke and many of the top level Shihan in the Hombu Dojo. This is something that we all need to do, and more. In a time where many dangers constantly surround us, every advantage a person has will help them achieve a higher level of self preservation. Basic principles of self defence, and how to protect oneself in environments ranging from a busy store, to an empty parking lot, are brought to you in a simple and light-hearted teaching. Knowledge, combined with awareness and confidence could save your life. We will make your world a safer place.